I’ve been trying to have a bit of a sort out at home, including my sewing room. Whilst mooching through boxes I found an embroidery I did years ago, 1988 to be precise, I know that because luckily I embroidered my name and the year at the bottom. So it’s been sitting in my sewing box for thirty years waiting to be made into something! I seem to remember this was a Dimensions kit, one of those with a picture printed onto fabric which you then embellished with embroidery. 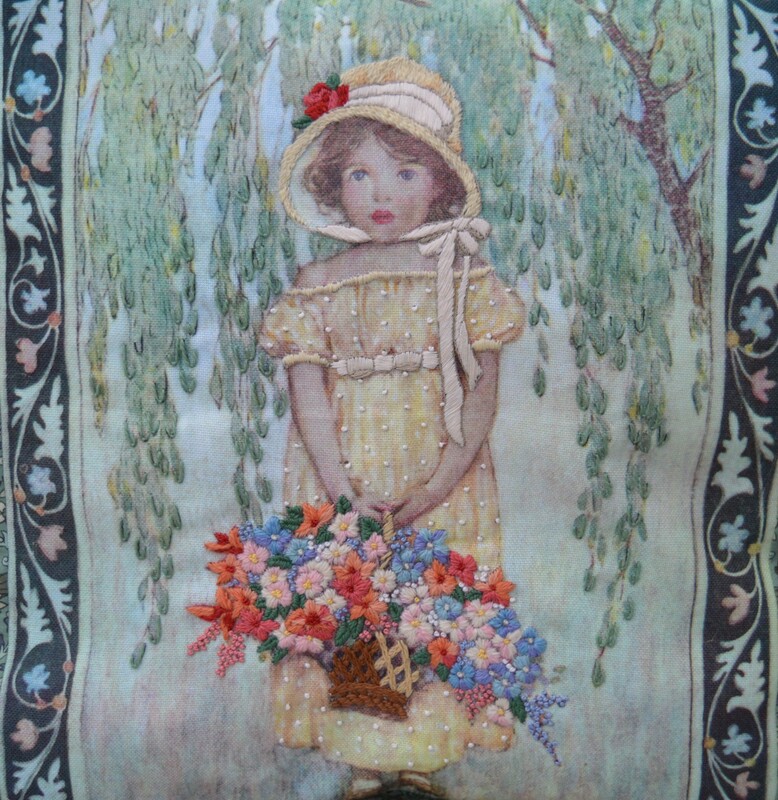 My mum did exactly the same one, her version was put in a fire screen which now lives with us! The embroidery isn’t perfect but I’ve got to the point with various unused items like this that I either make something or it goes! I decided to make a cushion. The embroidery is oblong so my original plan was to add a side border to square it up and make a 16″ cushion. The design already had a printed side border so adding another one would fit in. I even sent my OH out to a fabric shop to buy a pad! I found a fat quarter from my stash that matched pretty well both in terms of colour and style. However I discovered that to square it up the borders would actually be pretty narrow, I looked at making it oblong the other way, but I then felt I lost some of the design in the curve of the cushion. I found another co-ordinating fabric! I stitched the first pair of borders on either side. I then added a 2″ border on all four sides in the darker green. It framed it nicely. There was also enough of the dark green to back the cushion. By this time it was a lot bigger than 16″, it was more like a slightly oblong 20″! As it happens I had just, the day before, put an unused IKEA 20″ cushion pad in a box for charity, on the grounds that I never make cushions that big!! I retrieved it from said box! I’ve made the back with a pillowcase opening, it seems to happily stay closed without any buttons etc. I popped the cushion pad in, it will need replacing when I next go to Skipton as it’s a pretty thin pad, but it will suffice for now. It looks great on the sofa in the conservatory, not too big either! 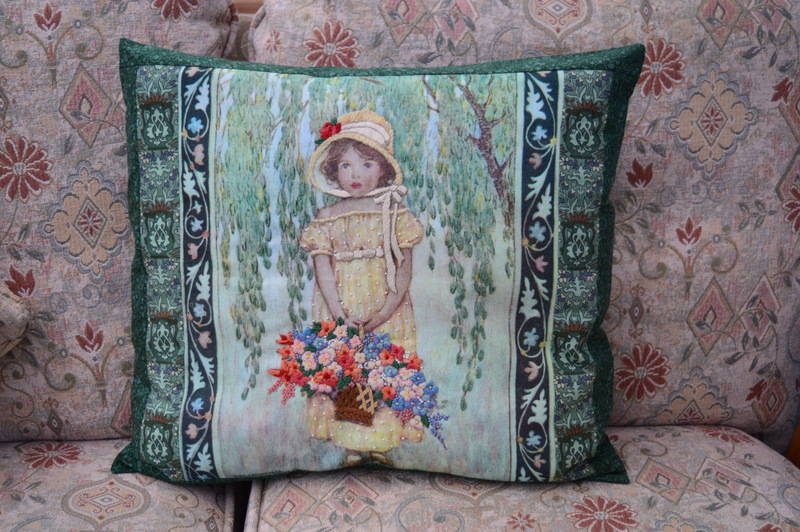 This entry was posted in Crafts, Home and tagged Cushion, Dimensions embroidery, embroidery. Bookmark the permalink. well done for getting this pretty piece finished after 31 years lol. 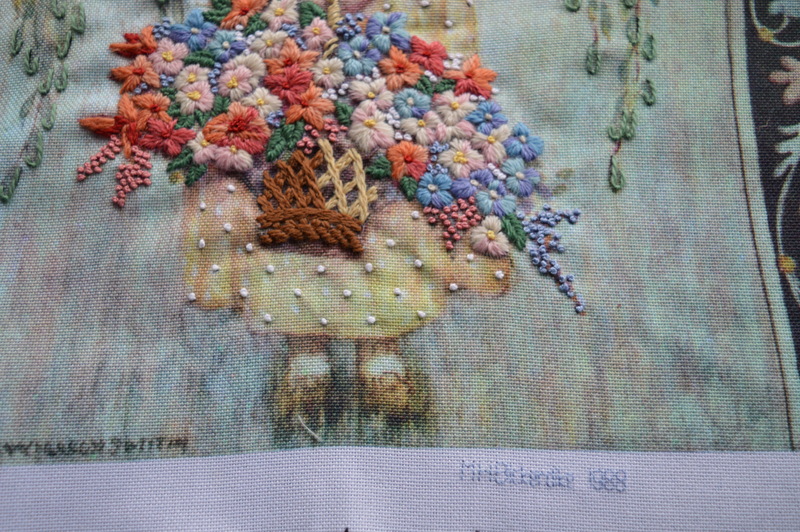 I have some past xstitch projects in my drawer awaiting a finish, but nothing this old! The coordinating fabric goes amazing well and congratulations on the finish. I definitely have a few of these types of projects… I think my grandma’s record on a sweater was 40 years to finish! This is perfect in a conservatory, I love the matching borders. Congratulations on finishing this. Turned out beautifully…what a great save and now a gorgeous treasure! The border fabrics you found work splendidly with this; congrats on getting a lost UFO out for display! Well done on finishing your 30 year old UFO, It makes a lovely cushion. I hate to admit it but I have a crewel embroidery kit that is all birds and is as old as yours or older. ha… I need to get that out and see what is salvageable since yours turned out so good. Great idea for such a pretty work, and the side panels enhance it. I love how you just seem to whip these things up (although it did take all those years!). Fun to be able to finally complete something you’ve held onto for such a long time. It’s very pretty, and your solution to the size problem really works. I get such wonderful ideas from you. It looks great! Amazing pillow and the stitching is amazing! Your fabric border looks like it was meant for that piece. I so enjoy reading your blog. Thank you for doing it.